Two Roads Road Jam Raspberry Wheat Ale makes a warm weather return on April 15th. The wheat ale use 100% real raspberries and lemongrass stalks. This tart, refreshing beer is the perfect summer complement for outdoor fun. New for 2015, Two Roads Road Jam will be available in six pack cans, the Beer Bus Variety pack, as well as bottles and draft. Two Roads Brewing’s (Stratford, CT) newest is a blonde barleywine dubbed 20 Ton Ale. The beer honors an inherited 20-ton overhead crane left over from when the production facility was US Baird Automatic Machine facility. The crane isn’t fully operational, but the brewery does use it from time to time. A behomoth of a beer, it’s brewed with Golden Promise (known for its distinct vanilla biscuit character) malt and generously hopped with a blend of both cutting-edge and classic hop varieties. The result is a decidedly fruity and piney heavyweight brew clocking in at 12% alcohol and loaded with plenty of hop character that makes it enjoyable upon release or after aging in a cool cellar. Two Roads 20 Ton Ale is available starting this week in 750ml bottles, and limited draft. Two Roads Holiday Ale makes it’s return November 5th, 2014. Holiday Ale is based on the biere de noel style, a spin off of the biere de garde style. In France, small farmhouse breweries make biere de noel in the weeks leading up to Christmas. Those ales are maltier, and richer than the biere de garde counterparts. Two Road Holiday Ale hits the tasting room starting on Wednesday November 5th, alongside Route of All Evil. Two Roads (Stratford, CT) Route of All Evil is back for another winter, this time with new artwork. The beer is a porter meets black iPA. …Brewmaster Phil Markowski wanted to play with using all three to create a unique beer that’s truly on the Route of All Evil. Hopped using Pacific Northwest hops and chock full of dark roasted malts- the result is truly taking a road less shoveled. 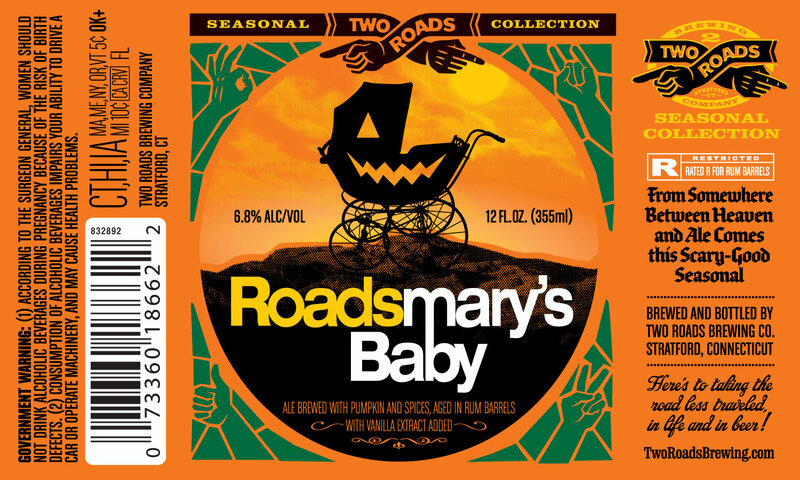 Two Roads Route of All Evil is available seasonally in 12oz bottles and draft.